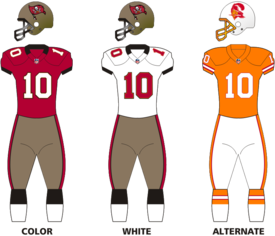 The 2009 Tampa Bay Buccaneers season was the franchise's 34th season in the National Football League the 12th playing their home games at Raymond James Stadium, and the first under head coach Raheem Morris. The Buccaneers looked to improve on their 9–7 record from their 2008 season and 3rd-place finish in the NFC South but failed to do so as they finished the season at 3–13, missing the playoffs for the second straight year. The Buccaneers played seven of their home games at Raymond James Stadium. One of their home games was played at Wembley Stadium, as part of the International Series, in which they lost to the New England Patriots 35–7. The Buccaneers unveiled a Ring of Honor to celebrate the 30th anniversary of the 1979 franchise. Lee Roy Selmon was the first inductee when the team wore throwback uniforms on November 8 in a game against Green Bay that they won 38–28. On January 16, 2009, less than three weeks after the 2008 regular season concluded, head coach Jon Gruden and general manager Bruce Allen were fired. The following day, Raheem Morris, recently promoted from defensive backs coach to defensive coordinator, was instead elevated to head coach, with Mark Dominik named general manager. The remainder of the coaching staff was finalized by mid-February. Luke McCown was re-signed to a two-year contract on February 9 worth $7.5 million. Dirk Johnson was signed as punter to replace Josh Bidwell who was placed on IR due to a hip injury). Acquired Kellen Winslow II in a trade with Cleveland for a second round draft pick in 2009 and a fifth round pick in 2010 on February 27. Luke McCown was traded to the Jacksonville Jaguars for a 2010 undisclosed draft pick on September 5, 2009. Tampa Bay traded their second-round selection and 2010 fifth-round selection to Cleveland for Kellen Winslow, Jr..
Baltimore traded conditional late-round selections in 2009 and 2010 to Tampa Bay for Marques Douglas. Tampa Bay traded their sixth-round selection to Chicago for Brian Griese. In a separate deal, the Bears traded their own sixth-round selection to the Buccaneers for Dan Buenning. Jacksonville traded their seventh round selection in 2009 and two selections in 2008 to Tampa Bay for their second-round selection in 2008 (used to select Quentin Groves). Tampa Bay traded their own 2009 seventh-round selection to Pittsburgh for Sean Mahan. The Buccaneers announced that they would not return to Disney's Wide World of Sports Complex to hold Training Camp, where they had done so from 2002–2008. Training camp instead would be held at the team's regular facilities at One Buc Place. John Lynch joined Chris Myers in the preseason booth for games televised on WFLA-TV. Dan Lucas served as sideline reporter. On August 18, free safety Tanard Jackson was suspended four regular-season games for violating the NFL Substance Abuse policy. On August 19, Aqib Talib was arrested, accused of simple battery and resisting arrest. Ten days before the start of the regular season, offensive coordinator Jeff Jagodzinski was fired. Quarterbacks coach Greg Olson was elevated into the vacancy. Tan indicates the International Series game in London. Tampa Bay was the designated home team. Orange indicates designated throwback uniform game. The first regular season game for head coach Raheem Morris saw the Buccaneers fall to the Dallas Cowboys by a score of 34–21. Running back Cadillac Williams returned as a starter, and rushed for 97 yards and one touchdown. Quarterback Byron Leftwich threw for 276 yards, one touchdown, and no interceptions. The Buccaneer defense, however, gave up three big plays in the loss. Dallas quarterback Tony Romo threw for a career-best 353 yards. Three long touchdown passes (66, 80, 44 yards respectively) put the game out of reach. Early in the fourth quarter, Tampa Bay closed the deficit to 20–14, but Romo's 80-yard catch & run to Patrick Crayton put the Cowboys ahead for good. On specials teams, kicker Mike Nugent had one field goal attempt blocked, and shanked another. The Buccaneers made their first regular season trip in franchise history to Ralph Wilson Stadium to meet the Bills. The Buccaneers had played only one time at Buffalo, a preseason game in 1977. Byron Leftwich threw for 296 yards and three touchdowns, but the Bills held Tampa Bay to only 57 yards rushing, and the Buccaneers had 13 penalties for 112 yard in the loss. Leading 20–7 with less than a minute remaining in the first half, Buffalo looked to score once more. However, Fred Jackson fumbled at the Tampa Bay 16, and Sabby Piscitelli recovered. Piscitelli ran 72 yards to the Buffalo 8, and after a touchdown on the next play, Tampa Bay trimmed the deficit to 20–14. Late in the fourth quarter, Leftwich led the Buccaneers on 14-play scoring drive, twice converting on 4th down. The touchdown could have brought the Buccaners within 8 points, but a failed two-point conversion ultimately foiled the comeback. Tampa Bay dropped to 0–2, and lost their sixth consecutive game, dating back to 2008. Still looking for their first win of the season, the Buccaneers went home for a Week 3 duel with the New York Giants. Tampa Bay would trail early in the first quarter with Giants running back Brandon Jacobs getting a 6-yard touchdown run. The Buccaneers'deficit would climb in the second quarter with quarterback Eli Manning's 4-yard touchdown pass to wide receiver Steve Smith. New York continued its dominance in the third quarter with kicker Lawrence Tynes nailing a 26-yard field goal. In the fourth quarter, the Giants would close out the game with Manning's 18-yard touchdown pass to wide receiver Sinorice Moss. With the loss, the Buccaneers fell to 0–3. Following their shutout home loss to the Giants, the Buccaneers flew to FedExField for a Week 4 duel with the Washington Redskins. Due to Byron Leftwich's poor performance during the first three weeks of the season, quarterback Josh Johnson would get his first career start. Tampa Bay would come out firing in the first quarter with Johnson's 8-yard touchdown pass to wide receiver Antonio Bryant, followed by kicker Mike Nugent's 37-yard field goal in the second quarter. However, the Redskins came back with a vengeance in the third quarter. Kicker Shaun Suisham would get a 42-yard field goal, followed by quarterback Jason Campbell's 17-yard touchdown pass to tight end Chris Cooley (with a blocked PAT) and a 59-yard touchdown pass to wide receiver Santana Moss. The Bucs tried to rally in the fourth quarter as Nugent nailed a 22-yard field goal, but Washington's defense would prevent any further progress. With the loss, the Buccaneers fell to 0–4. Hoping for their first win of the season, the Buccaneers flew to Lincoln Financial Field for a Week 5 duel with the Philadelphia Eagles. Tampa Bay would immediately trail in the first quarter as Eagles quarterback Donovan McNabb hooked up with wide receiver Jeremy Maclin on a 51-yard touchdown pass. Philadelphia would increase their lead in the second quarter with McNabb completing a 20-yard touchdown pass to fullback Leonard Weaver. The Buccaneers would get on the board with quarterback Josh Johnson's 9-yard touchdown pass to tight end Kellen Winslow, but the Eagles would close out the first half with McNabb finding Maclin again on a 40-yard touchdown 40-yard touchdown pass. In the third quarter, Philadelphia would increase their lead with running back Brian Westbrook getting a 7-yard touchdown run. The Eagles would then start off the fourth quarter with kicker David Akers nailing a 44-yard field goal. Tampa Bay tried to rally as Johnson connected with Winslow again on a 9-yard touchdown pass, but Philadelphia closed out the game with defensive end Darren Howard tackling running back Cadillac Williams in his endzone for a safety. With the loss, the Buccaneers fell to 0–5. Still trying to acquire their first win of the season, the Buccaneers went home for a Week 6 NFC South duel with the Carolina Panthers. Tampa Bay sailed off to a good start in the first quarter with a 20-yard touchdown run from running back Cadillac Williams. However, the Panthers would tie the game in the second quarter with running back DeAngelo Williams getting a 20-yard touchdown run. During the second quarter, punt returner Clifton Smith left the game due to a concussion caused by Panthers cornerback Dante Wesley ramming into Smith. Wesley was flagged for unnecessary roughness and was ejected. Carolina would take the lead in the third quarter with quarterback Jake Delhomme completing a 1-yard touchdown pass to tight end Jeff King and running back Jonathan Stewart getting a 26-yard touchdown, yet the Buccaneers immediately got themselves back into the game as rookie wide receiver Sammie Stroughter returned the kickoff 97 yards for a touchdown. In the fourth quarter, Tampa Bay tied the game with safety Tanard Jackson's 26-yard interception return for a touchdown. However, the Panthers delivered the final blow with Williams' 1-yard touchdown run. With the loss, the Buccaneers fell to 0–6 for the 1st time since 1985. Still on the hunt for their first win of the season, the Buccaneers flew to Wembley Stadium for Week 7's NFL International game with the New England Patriots. For this game, Tampa Bay was listed as the home team. The Buccaneers would trail early in the first quarter as Patriots safety Brandon Meriweather returned an interception 39 yards for a touchdown, followed by quarterback Tom Brady finding wide receiver Wes Welker on a 14-yard touchdown pass. New England increased their lead in the second quarter as Brady completed a 54-yard touchdown pass to wide receiver Sam Aiken, yet Tampa Bay would get onto the board with quarterback Josh Johnson completing a 33-yard touchdown pass to wide receiver Antonio Bryant. However, the Patriots took control throughout the second half as Brady hooked up with tight end Benjamin Watson on a 35-yard touchdown pass, while running back Laurence Maroney got himself a 1-yard touchdown run. With the loss, the Buccaneers went into their bye week at 0–7 for the 1st time since 1985. With the Rams' win over the Lions and the Titans win over the Jaguars in the same week, the Buccaneers were the NFL's only winless team. Coming off their bye week, the Buccaneers went home, donned their throwback uniforms, and played a Week 9 duel with the Green Bay Packers. This game would be the first career start for rookie quarterback Josh Freeman. Tampa Bay would trail early in the first quarter as Packers quarterback Aaron Rodgers completed a 74-yard touchdown pass to wide receiver James Jones. The Buccaneers would get on the board with Freeman finding running back Derrick Ward on a 6-yard touchdown pass, but Green Bay answered with running back Ryan Grant getting a 2-yard touchdown run. In the second quarter, Tampa Bay fired back as cornerback Ronde Barber returned a blocked punt 31 yards for a touchdown, but the Packers replied with Rodgers hooking up with wide receiver Donald Driver on a 32-yad touchdown pass. The Buccaneers would close out the half with kicker Connor Barth booting a 38-yard field goal. After a scoreless third quarter, Green Bay would strike again in the fourth quarter as Rodgers got a 12-yard touchdown run. Afterwards, Tampa Bay took the lead as Freeman completed a pair of 7-yard touchdown pass to tight end Kellen Winslow (with a failed two-point conversion) and rookie wide receiver Sammie Stroughter (with a successful two-point conversion pass to wide receiver Michael Clayton). The Packers tried to get a comeback, yet safety Tanard Jackson came through with a 35-yard interception return from a touchdown. With the win, the Buccaneers improved to 1–7. Coming off their home win over the Packers, the Buccaneers flew to Land Shark Stadium for a Week 10 interconference duel with their in-state rival, the Miami Dolphins. In the first quarter, Tampa Bay struck first as kicker Connor Barth got a 51-yard field goal. However, the Dolphins would answer with a 1-yard touchdown run from running back Ronnie Brown (with a blocked PAT). Miami would add onto their lead in the second quarter with a 49-yard field goal from kicker Dan Carpenter. The Buccaneers would reply with Barth's 50-yard field goal, but the Dolphins would take a huge lead as quarterback Chad Henne completed a 5-yard touchdown pass to tight end Kory Sperry, followed by Carpenter getting a 30-yard field goal. Tampa Bay would get the only score of the third quarter as Barth nailed a 54-yard field goal. The Buccaneers would creep closer in the fourth quarter as rookie quarterback Josh Freeman completed a 33-yard touchdown pass to wide receiver Maurice Stovall, yet Miami continued to have their way as Carpenter booted a 45-yard field goal. Tampa Bay would take the lead as running back Cadillac Williams got a 1-yard touchdown run, but the Dolphins got the last laugh as Carpenter made the game-winning 25-yard field goal. With the tough loss, the Buccaneers fell to 1–8. Trying to avoid a 3-game losing streak, the Buccaneers flew to Georgia Dome for an NFC South rivalry match against the Atlanta Falcons. In the first quarter the Bucs trailed early as kicker Jason Elam nailed a 45-yard field goal, and then with QB Chris Redman making a 22-yard touchdown pass to RB Jerious Norwood. Then the Bucs replied with QB Josh Freeman making a 42-yard touchdown pass to WR Antonio Bryant, then kicker Connor Barth made a 39-yard field goal. In the third quarter the Bucs took the lead when Freeman hooked up with Cadillac Williams on an 8-yard touchdown pass. Then the Falcons lost the margin when kicker Jason Elam got a 37-yard field goal. In the final seconds of the fourth quarter the Bucs fell behind when Redman made a 5-yard touchdown pass to WR Roddy White. With the loss, the Buccaneers fell to 1–10 and stay winless on the road after 5 visits. Additionally, the team was officially eliminated from postseason contention. The Jets were without starting quarterback Mark Sanchez, but the Buccaneers were unable to take advantage. The Tampa Bay defense allowed 175 yards rushing, and quarterback Josh Freeman, coming off a five interception game the previous week, struggled to read New York Jets coach Rex Ryan's exotic blitzes. Freeman finishing the day with three interceptions and a passer rating of just 12.1, well below his season average of 59.8. Coming off their home loss to the Jets, the Bucs flew to Qwest Field for a week 15 duel against the Seattle Seahawks. After a scoreless first quarter, Seattle got on the board first with QB Matt Hasselbeck's 29-yard pass to tight end John Carlson. The Bucs got on the board with Connor Barth's 28-yard field goal to end the first half. In the third quarter, Tampa Bay took the lead after a 45-yard field goal and a 22-yard touchdown pass by QB Josh Freeman to running back Cadillac Williams, set up by a Tanard Jackson interception. The Buccaneers further extended their lead with a 28-yard pass to running back Derrick Ward, with a successful two-point conversion. In the fourth quarter, Barth kicked another field goal for 39 yards. Seattle tried to rally, but Hasselbeck threw an interception (his fourth) in the end zone to cornerback Elbert Mack for a touchback. With the win, the Buccaneers improved to 2–12. Not only was it their first road win since November 23, 2008, it also marked their first win on the west coast since winning Super Bowl XXXVII in San Diego and their first win in Seattle since 1999. The Saints dominated the first quarter and entered halftime riding on a 17–3 lead. Tampa Bay scored two touchdowns in the fourth quarter, including a 77-yard kick return by Micheal Spurlock, to tie the game at 17. As time expired, Garrett Hartley attempted a 37-yard field goal that would have salvaged the game for the Saints, but the kick hooked left. In overtime, Tampa Bay won the coin toss, received the kickoff, and drove down the field to win the game with a field goal, for a final score of 20–17. This was the first time in franchise history that the Bucs defeated the eventual Super Bowl champions. At 44 °F, it was the second-coldest home game in Buccaneers history. ^ "Selmon To Be First Buc Inducted Into Ring Of Honor". Pewter Report. 22 July 2009. Archived from the original on 2009-08-17. Retrieved 20 August 2009. ^ "Bucs To Unveil Throwback Uniforms On Friday". Pewter Report. 29 July 2009. Archived from the original on August 5, 2009. Retrieved 20 August 2009. ^ "Gruden, Allen Dismissed". Buccaneers.com. 16 January 2009. Retrieved 16 January 2009. ^ "Raheem Morris, Mark Dominik Step up to Head Jobs". Buccaneers.com. 17 January 2009. Retrieved 11 February 2009. ^ "Bucs Complete 2009 Coaching Staff". Buccaneers.com. 11 February 2009. Retrieved 11 February 2009. ^ "McCown Re-Signs with Bucs Before Free Agency". Buccaneers.com. 9 February 2009. Retrieved 11 February 2009. ^ "Bucs Re-Sign QB McCown". PewterReport.com. 9 February 2009. Archived from the original on February 11, 2009. Retrieved 11 February 2009. ^ "Buccaneers add veteran QB Leftwich". espn.com. 13 April 2009. Retrieved 17 August 2009. ^ Withers, Tom (27 February 2009). "Winslow traded to Tampa Bay". Associated Press. Retrieved 27 February 2009. ^ "Tanard Jackson Suspended for Four Games". Buccaneers.com. 18 August 2008. Retrieved 20 August 2009. ^ "Tampa Bay Buccaneers safety Tanard Jackson suspended four games for substance abuse violation". St. Pete Times. 19 August 2008. Retrieved 20 August 2009. ^ "Tampa Bay Buccaneers Aqib Talib arrested; accused of punching cabbie in Pinellas County". St. Pete Times. 20 August 2008. Retrieved 20 August 2009. ^ "PCSO Subject Charge Report". Pinellas County Sheriff's Office. Retrieved 20 August 2009. ^ "Just-hired Jagodzinski fired by Bucs". espn.com. 3 September 2009. Retrieved 4 September 2009. ^ "Official Gamebook, preseason – Buccaneers at Bills, 9/3/77" (PDF). BUCPOWER.com. Retrieved 16 September 2009. Wikimedia Commons has media related to 2009 Tampa Bay Buccaneers season.